In the wake of laying off hundreds of employees, it looks like Yahoo is about to make even more cuts. A leaked image initially caused speculation that the struggling Web giant plans to cut a number of its applications, including popular site Delicious. Yahoo confirmed this afternoon that it does indeed intend on closing its doors on a handful of “underperforming” and “non-core” segments. Among the axed Web properties are Delicious, Yahoo Buzz, AltaVista, Yahoo Picks, Yahoo Bookmarks, MyBlogLog, and AlltheWeb. The leaked screenshot reveals these sites listed under “sunset,” apparently Yahoo’s nice way of saying “you’re finished.” The photo was posted by MyBlogLog founder Eric Marcoullier earlier today. A Yahoo spokeswoman responded, saying, “We continuously evaluate and prioritize our portfolio of products and services, and do plan to shut down some products in the coming months….We will communicate specific plans when appropriate.” Other Yahoo personnel were much more irritated about the leak: Chief product officer Blake Irving responded Marcoullier’s tweet saying “Really dude? Can’t wait to find out how you got the web cast. Whoever it is, gone!” Marcoullier insists he found it online, and hopefully he’s telling the truth; the last thing Yahoo needs is a defector. The most significant cut is likely Delicious. Yahoo acquired the site five years ago for an undisclosed sum when the company was taking a stab at evolving into a social site. It was a large investment for Yahoo, and apparently one that did not pay off. 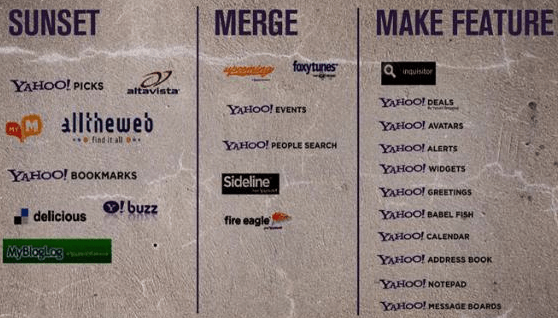 The leaked image also shows various Yahoo applications listed under headings titled “merge” and “make feature.” We feel like this is a pretty clear indication of what’s developing with the properties mentioned, but until Yahoo finds an “appropriate” time to let us in on its plans, we can only speculate what’s in store for the beleaguered website.